Heat the oil in a large saucepan over medium heat. Add the onion and garlic and cook for 4–6 minutes or until lightly golden. Add the paprika, tomato and harissa and cook, stirring, for a further 1 minute. Add the sweet potato and stock. Bring to the boil and cook for 8–10 minutes or until the sweet potato is just tender. Remove from the heat, add the tahini and stir to combine. While the soup is cooking, make the crispy chickpeas. Heat the oil in large non-stick frying pan over high heat. Add the chickpeas, salt and pepper and cook, stirring, for 4–6 minutes, or until crispy. 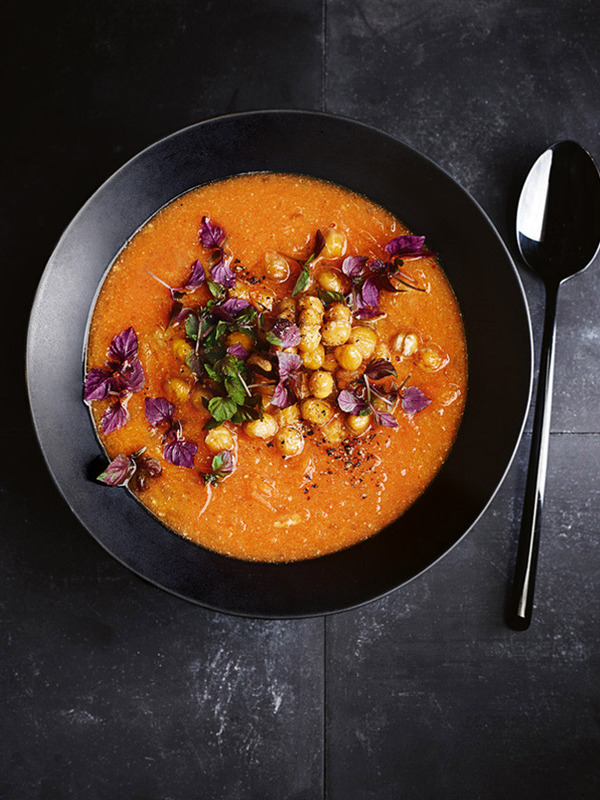 Divide the soup between serving bowls and top with the crispy chickpeas and shiso leaves to serve. Serves 4.